I think the NICU spoiled my babies . . . And it’s ok. They had a rough start to their lives. A rougher start than probably anyone I know. And they fought and survived. So it’s ok that they’re spoiled. It just means that they’re loved. 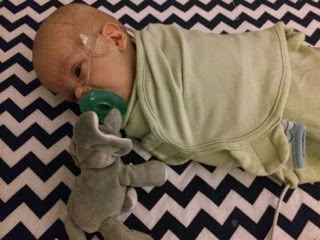 We have an amazing group of primary nurses, practitioners, doctors, therapists of all types, and techs who love our babies so much. What more can you ask for for your babies? Not much. That being said, my babies are spoiled rotten! The ones at home at least! So the boys are 16 weeks old this week (a few days ago on Tuesday). That’s 4 weeks adjusted. So they’re basically like 1 month olds. 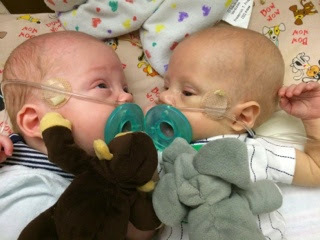 1 month olds who were born 3 months early. It’s still hard for me to fully comprehend the last few months. I’m sure I won’t fully wrap my arms around it for a long time. I may never fully understand why or just how much we’ve been through. But I do know that we’re triple blessed. And that we have lots of love. Lots of love from everyone around us. And lots of love to give these boys. This week has been crazy, which is why it’s Wednesday night and I’m sitting here with James just now beginning to write something. And why I’m finishing this hours later at home. And why it’s now Thursday and I’m finally actually posting this! The biggest news of the week is pretty huge. Mason came home on Sunday! Woop woop! (That’s an official medical term that Dr. Miquel uses during rounds. It’s always good when you hear that!) Yay Mason! He’s doing great so far. He didn’t sleep well the first night (and neither did we) but he’s slept great since then. The days are a different story though! Mason is the super spoiled one! He’s very happy as long as someone is holding him. And he doesn’t care who it is! Apparently he doesn’t realize that he’s a triplet! We’re trying to break him of this but it’s so hard because he’s super cute and cuddly! 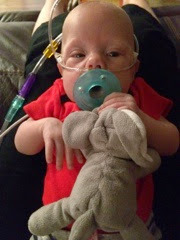 Mason is on 1/2 liter oxygen like Logan so we now have 2 oxygen tanks and 2 sets of tubes running around our house. Luckily Mason’s pulse ox alarm doesn’t go off hardly ever. Mason was discharged with a full page of diagnoses like Logan. And pretty much everything is resolved! That includes his IVH (the brain bleeds). 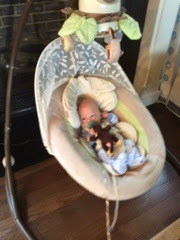 He had a normal head ultrasound last week! Yay! 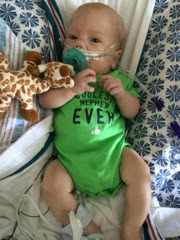 Mason’s only follow up appointments are with his pediatrician and the high risk newborn clinic. 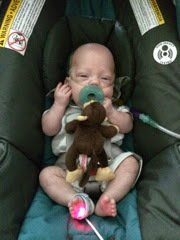 We went to the pediatrician on Tuesday and Mason looks great! He weighs 8 lbs 0 oz! He’s a big boy! And he actually slept 6 hours straight the night before his appointment so we asked if we have to wake him up to eat every 3 hours. Guess what? The doctor said he can sleep as long as he wants because his adjusted age is 1 month and he weighs 8 lbs.! We’re still waking him up though and he hasn’t missed any other bottles (but much slower than during the day). Logan is much calmer than Mason! He goes straight to sleep at bed time. He is more independent and ok being putting down (most of the time). And he sleeps through Mason’s meltdowns! 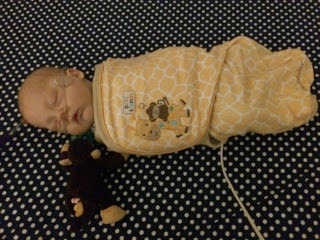 Logan only weighs 6 lbs 7 oz as of last Friday so he still can’t sleep through the night. But hopefully soon! He does go right back to sleep after his middle of the night feeds though so it’s not too bad! James has had a rough week. His reflux is really bad. Maybe worse than before. And I think he misses his brothers. He just seems so sad! I know I’ve said it before but it really breaks my heart when he cries because he’s in pain. I wish I could do something, anything, to make it to away. We did double his Prilosec on Monday and I think it’s starting to to help. James also started another round of steroids today to help his lungs. He’s not really making progress like he should so he needs some help. He’s on methyl prednisone, which is the same steroid they gave him to get off the ventilator. He’ll be on the steroid for 9 days. 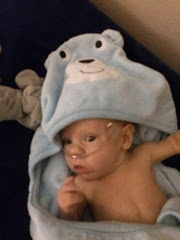 The plan is that he can get down to 1/2 liter flow by day 7 then we can think about starting oral feeds (finally). I don’t know what it is about James but he seems to get stuck and need more help moving forward sometimes. Maybe it’s because he’s the baby of the babies. 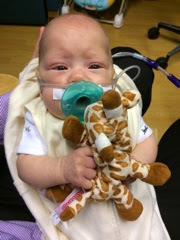 Whatever it is, it’s frustrating because we thought he was the healthiest of our babies with the healthiest lungs. Maybe he’s a faker. Whatever it is, I just hope he can get better so he can come home! 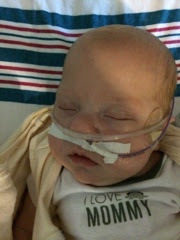 Unfortunately I think he’ll be living in the NICU for at least another month. Poor baby! 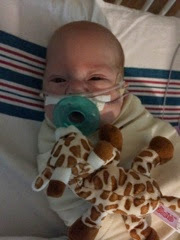 It’s harder for us to get up to the hospital to see James now that we have 2 babies at home, we’re back working a more regular schedule, and Addison just started back to school. Yesterday I went up to the hospital for about 30 minutes this morning before work then another 45 minutes after dinner. Today I only made it up there in the morning for about 30 minutes. Luckily we have our awesome primary nurses who James gets all to himself now. And they love him and know how to make him happy. I know we’ve been calling James the feisty one, etc. but I think he’s probably the calmest one of the three. He only cries when he’s hurting or when someone holds him down. And then he fights back! But he’s usually so sweet. Today he smiled for Brian. And Brian swears he did it on purpose. He posted the video on Facebook so check it out there. I teared up when he sent it to me! 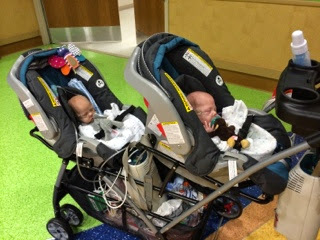 Mason leaving the hospital (with his friend Logan of course). Mason in the front, Logan in the back. 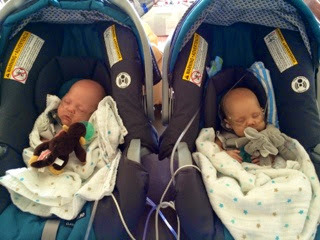 Mason and Logan at home right after we got home from the hospital (Mason on the left, Logan on the right). 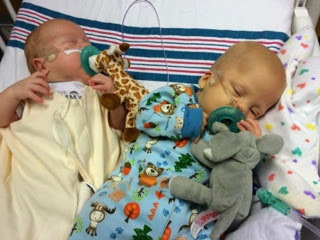 If you noticed in the pictures, all three of our boys LOVE their Wubbanubs (the pacis with the animals attached). 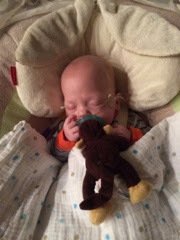 Mason has a monkey, Logan has an elephant (Mr. Floppy Ears), and James has a giraffe. I love them too. Not only are they super cute, they are actually really good for the babies. They are weighted so their pacis don’t fall too far and they can sometimes get them back without my help. And they give the babies something to hold onto, which they all love, especially James. Thanks everyone for your continued thoughts and prayers. I know it’s been a long time and we’re in the home stretch it seems but we still need it! And we still really appreciate it! 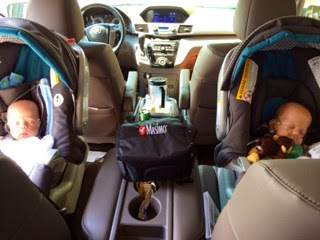 This entry was posted in #goals, Family, Homecoming Day, minivan, NICU, Triplet Milestones by Angela Mann. Bookmark the permalink. Saying a special prayer for the Manns today! What an inspiring story, and I am amazed by your courage and that of your sons! 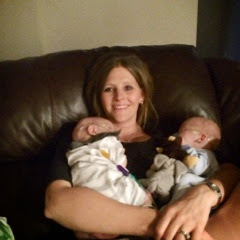 So thrilled that 2 babies are home, and I will pray that James will join his brothers at home soon. God bless you all!